Alright! The dangerous pirate is here to rob you all. It is easy to put together, and would be something unique for halloween. Prepare to scare and surprize them all. Stands very effective in a trick or treat encounteror a halloween fancy dress party alike. 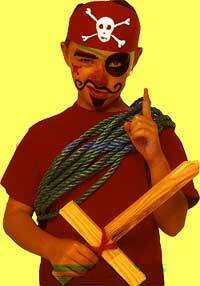 A Red Tshirt, some ropes, a scarf/headband, a sword made of two pieces of wood, and natural sponge, hairband or elastic, absorbant paper towel, black, green, red, purple, pink face paints, and a medium and a fine brush. You will need this page again and again if you choose to make it. So remember to hit Ctrl+D to the page. Tie the hair back. 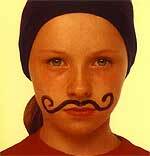 Use black face paint and the fine brush to paint moustache. It is a good idea to start at the centre of the lip and work outwards. Stay still while this is being done. Paint the outline for the eye patch with the fine brush. Close your eye while the outline is filled with black. 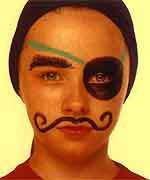 Paint a bushy eyebrow. Then paint the green straps for the eye patch. 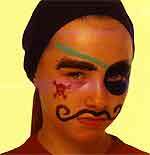 Paint the skull and the cross bones tatoo with red face paint and the fine brush. Use the medium brush to paint the pointy, black goatee. 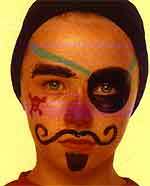 Use the natural sponge to dab the nose with pink face paint. Then dab purple face paint over the top of the pink.